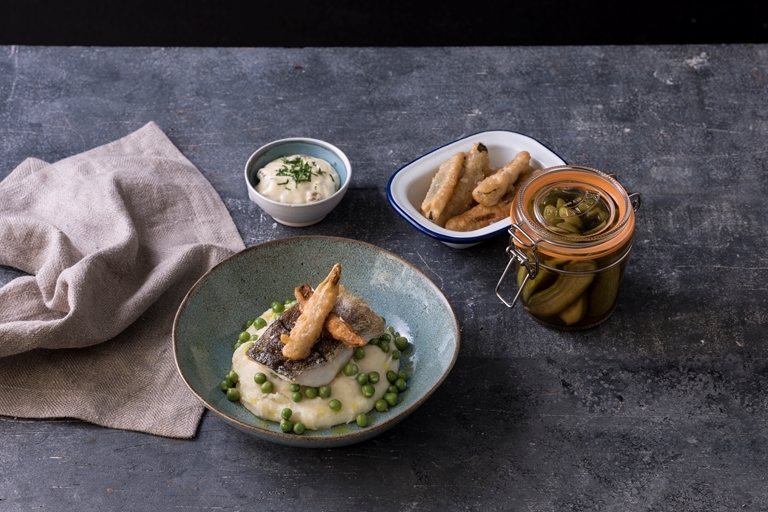 Pollyanna Coupland serves up a take on fish and chips, with pan-fried haddock served on a bed of salt and vinegar mash. The dish is served with beer-battered frickles – deep-fried pickles – a tangy, crisp delight. Here is a playful take on a the British classic fish and chips. The simple addition of malt vinegar and salt to mashed potatoes is borderline genius, you get that delicious soggy chip shop chip flavour with the velvety smooth texture of mash. I also relocated a crispy golden beer batter from its usual home encasing the haddock to instead tangy, sweet pickled cucumbers to make 'frickles' (fried pickles). Served with a lovely creamy homemade walnut mayonnaise and beautifully pan-fried haddock, you could almost get away with calling it a 'healthy fish and chips'!